Although Joe is better known as half of JOE GORDON and SALLY LOGAN, he has always had a great love of Ragtime and Traditional Jazz since his early days in Skiffle Groups and Jazz Clubs! His playing of Ragtime Banjo has surprised many listeners, and his first CD, "JOE GORDON'S RAGTIME BANJOS!" attracted many favourable comments. Joe was invited to play at the EDINBURGH INTERNATIONAL JAZZ FESTIVAL that year, and he has been a regular ever since! For the Banjo Enthusiasts!.......Joe has two main banjos. A restored WEYMANN, which is VERY ornate, and a "BITSA"??!! It has been all over the world with us AND in the wars! Broken neck. Cracked peg heads and resonator. But I have always ended up having it repaired, usually by Jimmy Egypt up in Glasgow. He does a marvellous job! He's a complete craftsman. My WEYMANN I bought from Jock Westwater in Edinburgh. I had bought a BACON & DAY SILVER BELL PLECTRUM from him, but I found the neck of that too deep for my small hands. So I swapped for the WEYMANN. It too, is lovely to play. I'll be using it on my next CD." For those interested in sound, I use SHURE SM 58's for vocals, and a MICROVOX SWAN NECK CONDENSER mic that allows me to move aound if I want to. It attaches to the pot with velcro. "Joe Gordon is a wonderful talent....his voice is as golden as his playing....the title cut STRUT MISS LIZZIE will have you hooked!....Joe has included several 'Rags' that show his command of the instrument....since acquiring this CD, it has become one of my favorites"
"It was a sheer delight to hear "JOE GORDON'S RAGTIME BANJOS!" at the Edinburgh International Jazz Festival this year.It's a rare occasion to hear Scott Joplin Melodies played on Banjo.....I would not hesitate to book this talented band again"
Sound Clips from "More RAGTIMEBANJOS!" "The authenticity you have presented on this CD, more than matches the very best!......fellow 'jazzers' from Toronto could hardly believe that a performance of this calibre came from Scotland. Congratulations Joe!" 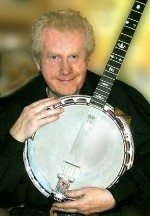 **If you want to book........"JOE GORDON'S RAGTIME BANJOS! "....see details below.